Anyone who has ever tended to a garden knows that zucchini grow in abundance during the summer months but you can always find new and creative ways to utilize the zucchini crop. With this zucchini bread, the squash is easily shredded using a coarse grater and the moist and flavorful result adds texture and interest to quick breads. It pairs perfectly with flavors like cinnamon and vanilla. 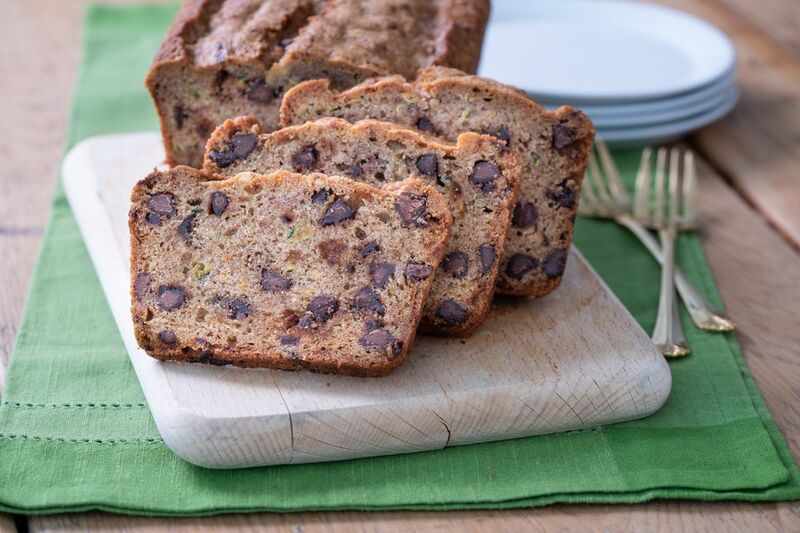 If you really want to have fun, Chocolate Chip Zucchini Bread is the way to go. With a few handfuls of semi-sweet chocolate chips, all of a sudden this classic quick bread becomes a sweet snack or summertime dessert treat. Shred zucchini using a coarse grater. Preheat oven to 350 degrees F. Grease and flour a 9 x 5-inch loaf pan or coat with non-stick cooking spray. In a medium bowl, stir together the flour, baking soda, baking powder, cinnamon, and salt. Set aside. In the bowl of a stand mixer, whisk the eggs and sugar until smooth. Whisk in the oil and vanilla until blended. Mixing by hand, stir in the flour mixture until just incorporated. Stir in the zucchini and chocolate chips until evenly distributed. Pour batter into prepared pan and bake until the tops are lightly browned, about 1 hour 10 minutes. The bread is done with a toothpick inserted in the center comes out clean. Cool bread in the pan on a wire rack for 15 minutes. Invert and remove from pan and allow to cool completely before slicing. The trick to the perfect rise and texture when baking quick breads of muffins, is to be sure not to overmix the batter. When you are ready to incorporate the wet ingredients into the dry mixture, give it just enough mixing necessary to make a uniform dough where no streaks remain after scraping down the sides and combining from the bottom of the bowl upwards. Anything beyond this will overmix the bread batter and result in a final product that is tough or gummy. With this recipe, because there is one final step of mixing in the shredded zucchini and chocolate chips, give the batter just a few turns at the end to evenly distribute throughout.